Brighton is such a colourful hive of shopping and eating and I am lucky enough to live only a short bus ride away. I visit about once a month to explore The Lanes, do a bit of shopping in Churchill Square and visit some of my favourite restaurants. Tucked away from one of the main shopping streets, is Preston Street, where there are two good oriental supermarkets (I am often found in Fortune Supermarket– two floors of not only Chinese ingredients but also Japanese, Korean, Thai etc- you can find most of the more obscure ingredients in my recipes in there). There also some great restaurants along this street. Goemon Ramen Bar appeared on the lower part of Preston Street around the time I was starting to get interested in ramen, in the Autumn of 2014. It is a very unassuming little place, with only a handful of tables and very minimal décor, but don’t let this put you off. I imagine that Goemon is like the authentic little ramen bars in Japan, with an emphasis on good food rather than flashy decorations. 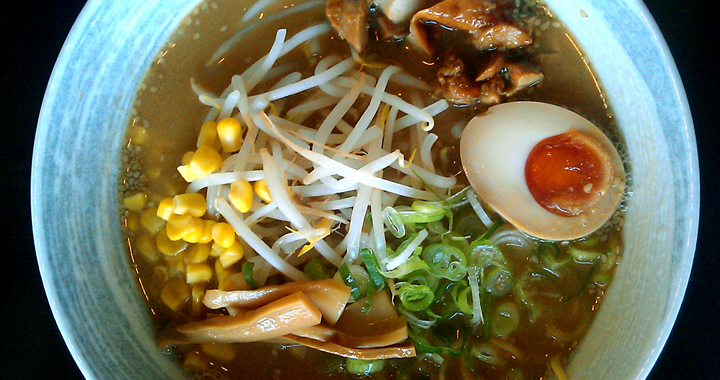 The menu is small and apart from sides and a few specials, consists entirely of ramen. I arrived at the restaurant quite early- just after 12pm- and I was the only one in there, but it soon started to fill up after I sat down. All the other customers in there were Japanese, which is a good sign that the food is pretty authentic! Goemon have a lunch deal where if you order ramen and then a side, the side is an additional £1.80, so your meal costs about £10, which I just had to go for even though I wasn’t sure I could eat it all. I opted for chicken miso ramen with a side of chicken gyoza. I also ordered melon ramune to drink, which is a Japanese soft drink in a strange glass bottle with a ball in it, which comes in all sorts of crazy flavours. The melon ramune is bright green and tastes nothing like an actual melon, like a lot of Japanese soft drinks in fruit flavours, but it really does taste good and quench your thirst. Because I love all things Japanese, I love the quirky novelty of this drink too! 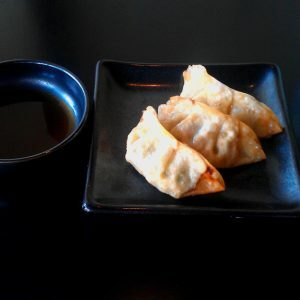 My chicken gyoza came out quickly with a sweet soy dipping sauce. They were the perfect fried gyoza- tasty and soft in the middle and crispy on the outside. Despite being fried, they weren’t at all heavy. Once I had finished the gyoza, my ramen came out. 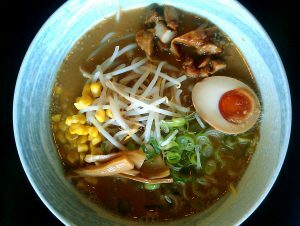 Goemon seem to focus on combining quite simple toppings with a tasty broth, so the bean sprouts, spring onion, sweetcorn and menma were all quite plain. I do love sweetcorn as a topping on ramen- something about the flash of the yellow in the bowl and the nutty flavour of the corn works so well. The noodles were great- cooked like al dente spaghetti with just a little bit of bite. The broth had a good depth of flavour and in comparison with other broths I have tasted, this one seemed relatively light and not too filling. With the gyoza it was just the right amount of food for me (this was my main meal of the day- there is no way I could have eaten this and then had a big meal in the evening!). The only disappointment was the chicken. Described as chicken chashu on the menu, it seemed to have been cooked to death, so that all its moisture was lost. A shame as everything else was great. Next time I think I would opt for a pork ramen, which I have had before and has always been really good. I think that the chicken (which looked like breast or possibly boneless thigh) was cooked for far too long- and cooked in the same method as pork chashu. It wasn’t terrible, it just wasn’t as great as everything else I ate there. Goemon always provides good value for money and something a little different to eat whilst out and about in Brighton. It’s always nice to support a small independent than a big chain. The staff are always friendly and welcoming and very willing to explain dishes, ingredients and make recommendations. It is well worth a visit if you are in Brighton and craving a bit of authentic Japanese food. Posted in Restaurant Reviews, Reviews and tagged Brighton, Restaurant, Reviews.